Sludge mavens CROWBAR have debuted an all new music video for their latest single, "Symmetry In White". Directed by Mike Holderbeast of Cement Level Studios (GOATWHORE, HIGH ON FIRE, EYEHATEGOD), this is the second video Holderbeast has done for the band having directed their last video for "Walk With Knowledge Wisely". 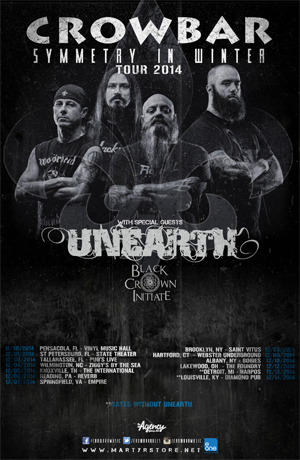 CROWBAR has also announced a new batch of tour dates with label-mates UNEARTH and BLACK CROWN INITIATE for December. Dates will kick off in Pensacola, FL at the Vinyl Music Hall and trek through the eastern half of the U.S. before finishing up in Longview, TX. View all dates below. Symmetry In Black was released back in May and sold over 4,000 copies in its first week of release, the highest of any LP’s in the band’s 25 year career, beating out its predecessor Sever The Wicked Hand released in 2011. "Teach The Blind To See"